The three architects of Turk-Islamic thought are Maturidi, Farabi and Yesevi and they all converge on mysticism in their approach to the “God-human relationship”. Because the religious beliefs and practices of Turks before Islam had so many mystic characteristics, it is necessary to seek the roots of Turkish Sufism, otherwise also known as Turkish mysticism or “folk piety”, in the ancient beliefs of the Turks. This power penetrated into the Turkish thought life so much that it is possible to see its influence in every stage of Turk-Islamic thought. The system of Turk-Islamic thought is called “Maturidilik” due to its theological and religious dimension and “Yesevism” due to its mystic dimension, to express “the first period of Turkish Sufism”. Thus Turkish thought expressed its own character by way of these names within Islamic civilization, and shaped and gave a new meaning to Islam. Turkish thought, because of its religious and philosophic approaches with a mystical character, prevented Turkish culture from losing out within the Islamic religion and provided an opportunity to formulate “Turkish Islam”. “Maturidism” is a name for a system of belief developed by the great Turkish religious scholar, Mansur Maturidi. Maturidi was born and died (d. 944) in Maturit, a district in the northwest of the city of Samarkand, an important center in Uzbekistan. Maturidi closely followed Ebu Hanife (d. 767) as he was constructing Turkish religious understanding. Ebu Hanife, who did not come from an Arab family but converted to Islam later in life, understood the difficulties faced by new Muslims. He averted these difficulties by applying comparison (Kiyas) and interpretation (Ictihat). This should be compared with the Medina movement which explained religion by narrating the Arab culture mixed with Sunnah of Prophet Muhammad, leading to Arab nationalism and equating Islam with Arab culture. This movement was successful in converting Egypt to this brand of Islam. Throughout history, Turkish people, who had a long-standing culture and profound cultural heritage, were not expected to leave their own culture and accept Arab culture. 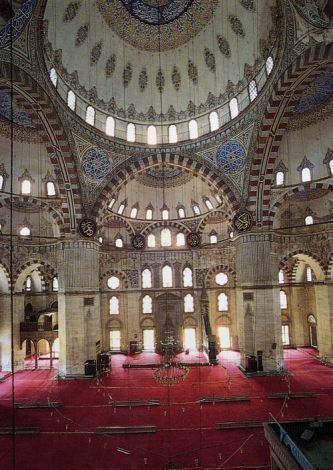 Instead they absorbed Islam into Turkish culture and formed Turk-Islamic thought. Maturidi desired to accomplish this aim by relying upon the method of Ebu Hanife, and he wrote two books, “Tevhid” on theological philosophy and the use of reason in religion and “Tevilat” on theological explanation of Quran, and through reason the belief system. An example of Maturidi’s approach is in reading the verses of the Quran. He, like Ebu Hanife, pointed the importance to understand the meaning correctly and promoted the use of native language. According to him, the fact that divine revelations descended in different languages was a proof of this. Hence it was not required to use Arabic language in prayer, providing new Muslims with the opportunity to protect their own identity, language and culture. It is important to note that this result was achieved through the use of reason. In his views, religion is a matter of reason and the mind. The human intellect and mind may comprehend religion by using the limits of its potential. The religious relationship of people exists at different levels because the level of human intellect is different. Philosophers and scholars may understand by thinking and applying proof through intellectual struggle. Other people may only comprehend through narration. Like children, they may understand through education, direction and stimulation. According to Maturidi, the role and importance of evidence in religion cannot be avoided because superiority and rightness of religion can be comprehended not by “imagination” but by evidence. With this view, Maturidi as a Turkish scholar developed a realistic approach to religion deprived of superstition and a “God-human” relationship which would not contradict reality. As long as the perception of “the unity and oneness of God” is protected as principle, human beings can interpret Quran within the realities of their own period. He proposes the “individual-centered” perspective in religion and thus solves the problem of “God-human being” relation without annihilating the individual freedom. It leaves human beings to their own heart, allowing them to go beyond daily perceptions of religion and reach the highest point of mystic vision and a real and permanent freedom. At that point, the individual knows not by thinking and comprehending, but as a witness. This is the last point an individual can reach. Here Maturidi reaches the highest level of rational mysticism and strengthens the dispositions of mysticism and Sufism, which are inseparable parts of “Turkish Islamic Thought”. Reference: "Philosophy among the Early Muslim Turkish States", Prof. Dr. Hanifi Ozcan, Dokuz Eylul University, Faculty of Divinity, Turkey, The Turks, vol.2, p.309, Yeni Turkiye Publications, Ankara 2002.